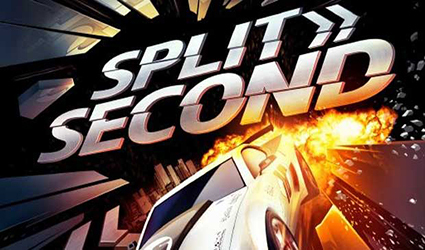 At its heart, Split/Second is a tribute to destruction wearing the mask of a racing game, and it is truly something else. With enough explosions to make Terry Crews’ abdominals smile, and the shedding of many of the genre’s traditional trappings, Split/Second is free to emphasize its adrenaline fueled power play moments. It is nothing short of a spectacular marriage of Just Cause 2’s reckless disregard for realism in lieu of just being plain fun, and “The Fast and the Furious” franchise…if there had ever been a good game made around said franchise. The basic premise of the game pits you in the middle of the world’s most over-the-top reality show. Immediately, this appears to be a fresh story, but is ultimately forgettable. While it has the potential to be interesting, it is guilty of being paper thin and underutilized. You’ll only be exposed to this plotline at the very beginning of, and the very end of, each ‘episode,’ the game’s stages, when a brief introduction to that episode is given, or when a preview of the next episode is given. This is a forgivable flaw though, unless you’re in the habit of picking up racing titles for their stunning narrative focus. Admittedly though, the intros and previews are done with all the production quality and believability of an actual reality show. What really sells the premise, at least what you get out of the intros and previews, is the music during these sequences; it is pitch perfect, and shows that the folks over at Black Rock have done their homework. 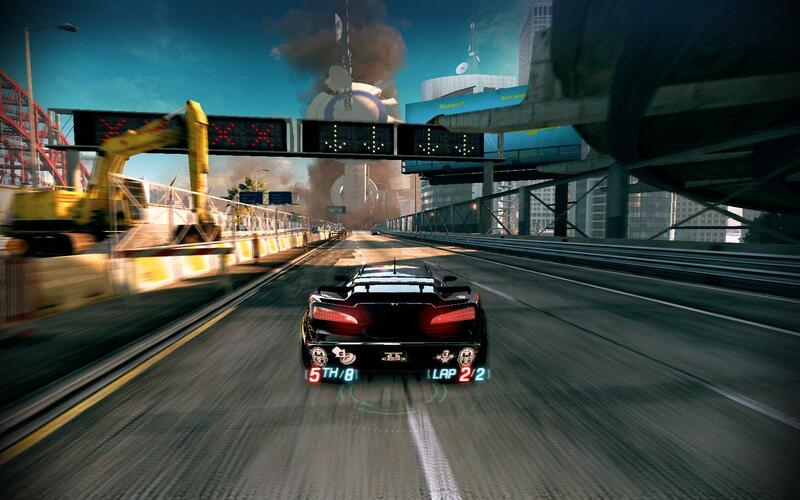 The rest of the game’s music is the typical fast paced mash-up you expect from a racing title – not that this is a bad thing, but none of it really stands out from the crowd. On the other hand, the sound effects, particularly for the dozens upon dozens of unique power plays, are presented in incredible, crisp detail. From the shattering of glass, to the terrifying mechanical roar of construction equipment collapsing, to those crowning epic moments where a few square blocks are reduced to rubble, and all other sound except the collapsing of buildings are deafened to emphasize the moment, the sound effects in this game are among the best of the best. Crafted with equal care are the game’s looks. The menus are sleek and easily navigable, and the user interface is like nothing else I’ve seen in a racing game. There is no mini-map due to the fact that the track can change in an instant, there are no superfluous meters, just the essentials; what lap you are on, what position you’re in, how much power you have for power plays, and when applicable, what your score is; all of these details hang on the back of your car. The indicators are clear, and the centralization of all the essential details is an excellent feature. It is simple, clean, effective, and perfect for minimalists. Unfortunately, there are few graphical settings on the PC version; there are four presets and the option to turn v-sync on or off, along with changing your resolution. One small detail which balances out the lack of options is that when you go to adjust the detail preset, you’ll see how each will make the game look exactly in the preview window. Running the game on very high, at 1680×1050 resolution and with V-sync on, with a 9800 GTX and a Phenom 9850 x4 @ 2.7 ghz, my system was taxed hard, and the frame rates were mostly unplayable. However, on high the difference in detail was minimal and the game only dipped below 60 FPS when several intense power plays were triggered all at once. Even without v-sync on, the screen tearing was almost never noticeable. 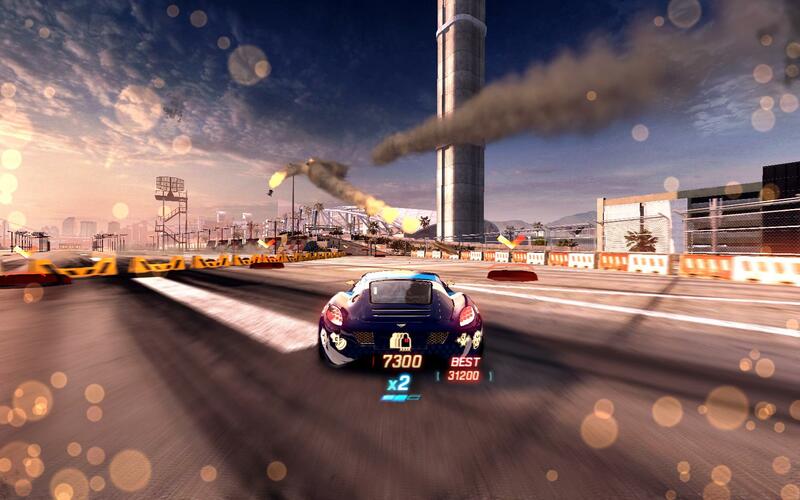 The game’s vistas are impressive, as are the rest of the game’s looks when you find time to tear your eyes from your car and the cacophony of chaos engulfing the track. 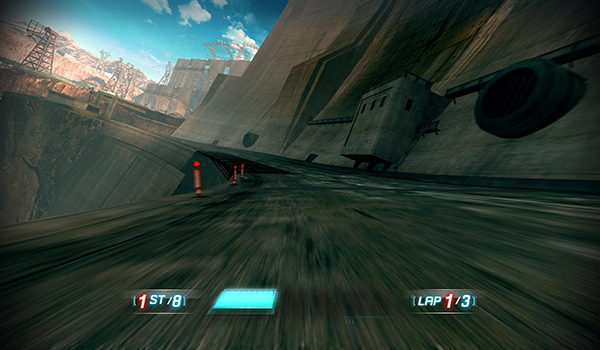 On top of this, Split/Second offers beautiful variation in its color palettes between all cars and tracks. There are roughly 6 completely distinct environments, and several tracks for each environment. The game’s primary mechanic is the triggering of power plays. Power plays are player controlled events, allowing the player to literally wipe out his competition. You gain power to deploy power plays by drifting around corners, drafting behind your opponents, making jumps, and dodging power plays deployed by your opponents. They come in two levels; the weaker and smaller scale “level 1” power plays, which might result in a helicopter dropping an explosive barrel in front of an opponent or a car detonating in the middle of a narrow alley, and the much more destructive “level 2” power play. As fun as they are, level 2 power plays are scarce compared to level 1s, and it’s hard to justifying saving up all that power, which somewhat defeats the purpose of the game. Of course, balance is a part of the reason for this scarcity. On the bright side, level 2 power plays result in some of the most breathtaking seconds of gameplay found in Split/Second. For example, a level 2 power play can result in the collapse of an enormous control tower, wiping out anything in its path as it plummets to the ground, creating a makeshift concrete ramp which can launch you onto a series of rooftop-to-rooftop jumps. Each track is packed with moments, some smaller scale and others quite large, like this. These moments can completely alter a track, making for an enormously dynamic experience. In the game’s campaign, there are a total of 72 events occurring over the course of 12 ‘episodes,’ consisting of 4 events plus an unlockable bonus event and a qualifying race for the next episode. There are no difficulty levels, and instead you’re left to deal with an absurdly easy beginning, and a merciless finale with a sharp transition. 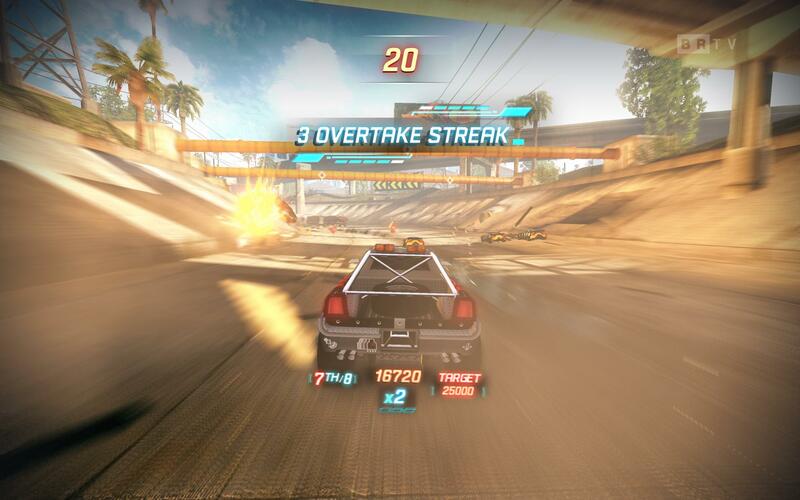 Most of the difficulty comes from a staple, and bane, of racing games everywhere; terrible ‘rubber-band’ AI which will routinely accelerate to impossible speeds to catch up and pass you. Because there is such a heavy emphasis on power plays, however, you can overcome this design flaw with proper use of power plays. While the rubber band AI maybe cheap, the power plays feel surprisingly fair across the board, while remaining incredibly rewarding to use successfully. You can keep your car in control through shockwaves if you’re a good enough driver, and you can react and adapt to falling objects and changing terrain. Early in the game, the cars handle like tanks, but this gradually improves, and within a couple of hours, everything is as smooth as butter. I only wish there was a display for handling at the car select menu, like there is for acceleration or speed. On top of this, the controls are not nearly as punishing as they are in traditional racing games, and only crashing head on into a wall results in a wreck. If you religiously play with manual shifting, you will be disappointed in this way. The breadth of gameplay modes is quite refreshing. While staples such as race and elimination appear, power plays make this traditional modes feel fresh, while unique additions such as airstrike, detonator, air revenge, and especially survival, all feel welcome and are some of the most enjoyable parts of the game. When and if you choose to take your races online, be warned that you will be at a huge disadvantage if you have not finished the campaign, as all the cars available in multiplayer have to be unlocked in the campaign. Players can choose from race, elimination, or the fresh and arcade-y survival mode, where you will be tasked with dodging exploding barrels jettisoned from the back of a moving big-rig, while having to overtake the trucks to gain points and multipliers. As far as the lobby goes, there is only one really remarkable feature, and that is the progress bar which indicates how far along a race in progress is. Aside from all this, the game’s multiplayer is available in local split-screen, LAN, or online. Despite a few flaws holding Split/Second back from perfection, this game still manages to achieve something that is rare for a racing title these days: its own completely distinct identity and gameplay. At its core, it’s a racing title, but it is also so much more than that, and is certainly worth its price tag, and then some.